Excellent compact day pack. It's ideal as a summit pack, for travel, or just smaller day hikes. 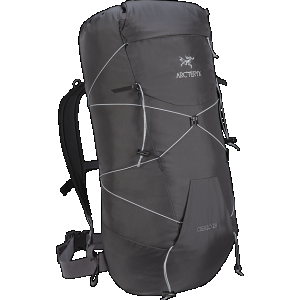 The Cierzo is a truly excellent pack with a number of innovative features. Its design as a summit pack defines it but doesn't limit its utility. Primarily it's a great multi-pitch rock climbing and summit pack for longer trips where you don't want to haul your 60Litre up a mountain. But this compressibility makes it ideal for travel and daily use as well. I took this pack trekking in Peru and on the odd day hike. The pack is very compressible and folds down into a its internal pocket, ending up about the size of roll of toilet paper. Unlike some packs it doesn't take too much effort to tuck it away. There is also a front pocket on the outside, that's a good size for a couple bars, and other items. This pocket is also where the cinch system tightens. Essentially the pack is wrapped by thin 2mm cord. Pulling the tab evenly tightens the whole pack. It works okay, you do need to tug it along a bit, but it definitely evenly reduces the size. The pack's closure mechanism works really well snugging itself shut to keep the weather out, or a very convenient rope carry system. It's also great for clipping into anchors at belay stations. Unlike most packs, the back faces you, ensuring ease of access when dropping an item has serious consequences. Packing the Cierzo is straightforward with a very generous top opening and the 18 litres is accurate. It has no framesheet, or even foam so when you are loading it up make sure to be aware of where you are putting hard items like bottles, or tuperware. It's also helpful to use the bizarre, but ingenious cinch system on the front of the pack to reduce the size and make sure everything sits where it should. Hiking with the pack is great. The straps are very thin to make it compressible, so you have to make sure the widest part sits correctly. The one size that fits all is a little short on my 5'10" frame with the hipbelt sitting well above my hips. But it's a lightweight pack, so this isn't a huge issue. Thanks for the Cierzo review, Tam. Got any pictures to show off how it loads and its features? Great minimalist day pack, suitable for short summit bids, bicycle commuting, and day-tripping from base camps. I was looking for a small capacity daypack for bicycle commuting. High on my list was finding a pack that would mount my flashing taillights so they are clearly visible. I ran across this pack on sale, and decided that it would fit the bill. First off, let's look at what this pack doesn't have. There is no "suspension" to speak of... no foam back panel... the shoulder straps are 1 1/2" webbing with no padding. Related to this is the one negative I have about this pack. The waist belt is so short as to be unusable. I can't see that anyone with a waist size larger than 32" would be able to use it. Don't quite understand the logic around this. Despite the lack of a proper suspension setup, this pack is quite comfortable with the kind of light/compact load that this pack is designed for. For me on my bicycling commute, that means lunch, a shirt or wind jacket, and a few bike tools. With a large main compartment, a small internal pocket, and a large zipper access front pocket, there are plenty of storage options. One of the features I really like is the gear attachment loop which runs across the entire width of the pack. It has a plastic sleeve over the webbing strap, which is very sturdy. My bike taillights clipped easily onto this, and are easily visible no matter how much or little there is inside the pack. The pack can be packed inside its front pocket, and packs down small. I have taken it on several backpack trips, and used it as a day pack for day trips from basecamp. 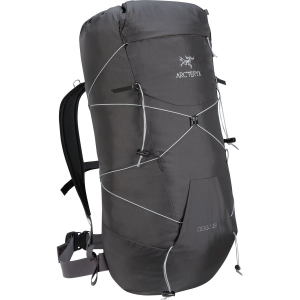 The pack is very well made, despite the lightweight mini-ripstop fabric. The fabric is coated polyurethane and silicone coatings, and access is through water-tight zippers, so the pack should withstand a fair amount of rain (though with our current drought conditions, I haven't had the chance to test that theory). As with most Arc'Teryx products, the craftsmanship here is superb, and should last a long time. All in all, I am very pleased with this pack. I can see using it for much more than what I initially purchased it for. Overall an excellent day pack/summit pack/climbing pack. 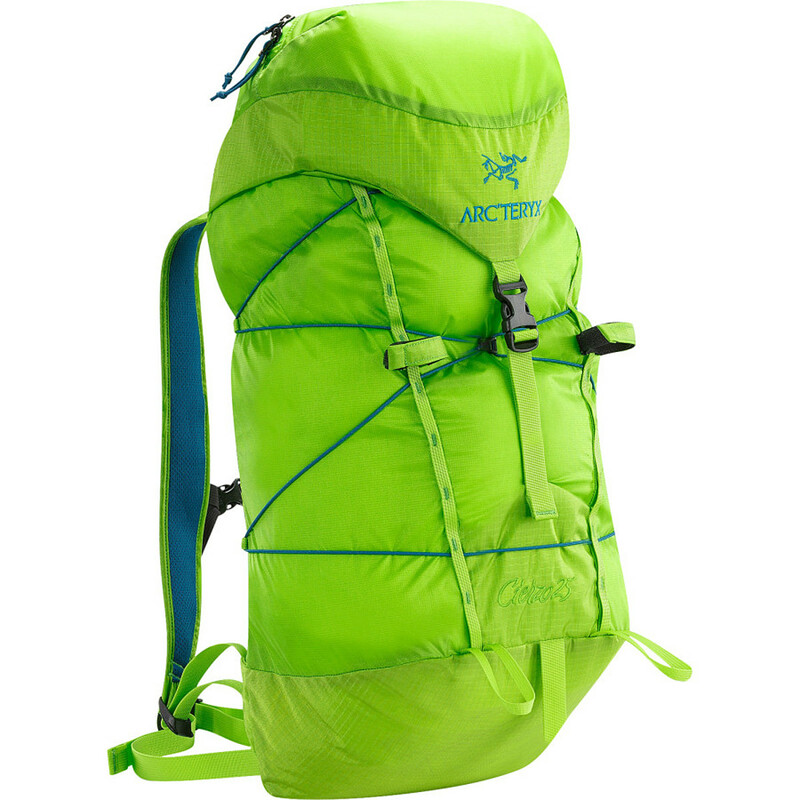 Nothing but a well-made sack here from the fine folks at Arc'teryx. Lightweight (283g w/ sternum and waist straps, of which are both removable), durable and highly water repellent. Also has one outer zip pocket in which the bag stuffs into itself for compressing if need be. Well done if you aren't carrying much more than 10-12 lbs., depending on individual thresholds. In regards to colors, it also comes in black. Amazingly light, clever construction with state-of-the-art materials. The particular colors chosen by Arc'teryx make you stick out like a neon unicorn in the woods, but, hey, a small price to pay for such innovative technology. When most manufacturers (with the possible exception of some GoLite and Black Diamond models) have gone more and more complex over the years -- adding zippers, straps, mesh pockets, key clips, and on and on -- Arc'teryx tries to hold the line with basic, functional, and oh-so-high-quality stuff. Good on them.